Another Jumpman H-Series shoe is set to make waves once again next month after the Jordan Brand announces the release of a new colourway this May 2011. The new Jumpman H-Series features a touch of the Chicago Bulls team colors, a colourway familiar for all the Jordan signature shoes. 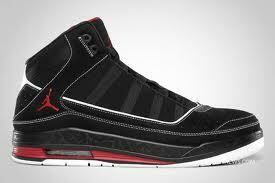 Coming out in Black/Varsity Red-White colourway, the Jumpman H-Series is expected to be hit next month. Start saving money now and grab one after its release next month! Another Jumpman H-Series Out in the Market! Another Jumpman C-Series Lined-Up Next Month! Another Jumpman C-Series Lined-Up This April!